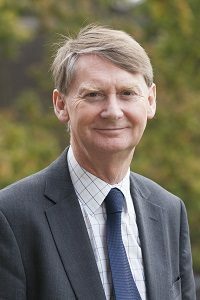 A professor from the University of Reading has joined the board of a global food research and development charity, whose aim is to provide food security for billions of people around the globe. The World Vegetable Center works across Asia and Africa to alleviate poverty and malnutrition in developing countries, and has appointed Professor Richard Ellis as one of three new directors of the centre. “I’m very pleased to have been invited to join the board of the World Vegetable Center. Malnutrition affects billions worldwide, as a result of poverty, in developed as well as developing countries. Improvements to vegetable production can benefit the nutrition of families and also their income in resource-poor households worldwide, whilst the rapid rebuilding of vegetable production after natural or man-made disasters is an important aspect of resilience. Professor Ellis will be contributing his experience in the relationship between seed and crop production and the environment to support the WVC’s genetic resources conservation and crop improvement work. Read the World Vegetable Center’s formal announcement of Professor Richard Ellis joining their board here. Professor Ellis is Director of Heath Partnerships and Professor of Crop Production at the University of Reading, UK. He has held the latter post since 1995, and was Dean of the Faculty of Life Sciences 2008–2016, and Head of the School of Agriculture, Policy and Development 1998–2008. He is the author of 342 publications on topics in seed and crop production: modelling the effect of the environment on the survival of seeds for seed storage and genetic resources conservation; the impact of climate change on crop production and quality; phenology (modelling the effect of environment and genotype on plant development); and agronomy. He has a long record of collaborative research on seed and crop physiology, crop improvement, agronomy, and crop genetic resources conservation with international agricultural research centres including Bioversity International, International Center for Agricultural Research in the Dry Areas (ICARDA), International Crops Research Institute for the Semi-Arid Tropics (ICRISAT), International Institute for Tropical Agriculture (IITA), and the International Rice Research Institute (IRRI), as well as the UK. He received his Ph.D. in Agriculture from the University of Reading. The University of Reading ranks among the world’s top 200 higher education institutions and is ranked 10th in the world for Agriculture (QS World University Rankings by Subject).It delivers research, teaching and innovation that integrates primary food production, food security, climate change, and international development, with world-leading and long-standing capabilities in agriculture, horticulture, food and nutrition, and meteorology. The World Vegetable Center is an international not for profit (i.e. charitable) vegetable research and development institute, which seeks to alleviate poverty and malnutrition in developing countries world through the increased production and consumption of safe, nutritious and health-promoting vegetables. The Center’s global research and development network now covers East and Southeast Asia, Oceania, sub-Saharan Africa, South Asia, and Central and West Asia. Its activities aim to strengthen the entire vegetable value chain, from vegetable seed systems and breeding to market access and human nutrition. The World Vegetable Center originated in Asia having been founded by the ASEAN countries in 1971 in Taiwan, where it is still headquartered, as the Asian Vegetable Research and Development Center.